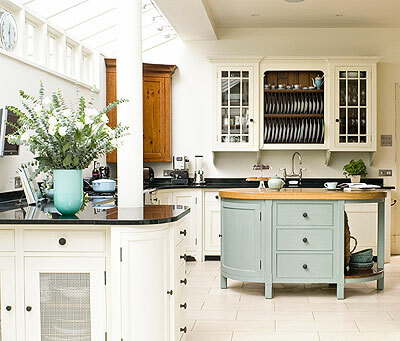 Now, where to start with this incredible kitchen? And it is utterly incredible, isn't it? 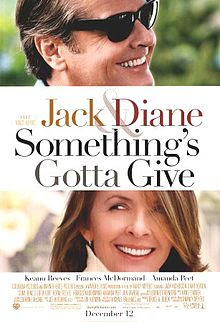 It's from the film Something's Gotta Give. 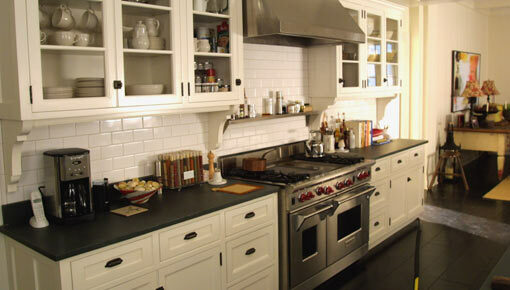 I was so impressed with all the people that guessed correctly on Friday when I shared a copycat kitchen. Round of applause for the film buffs! 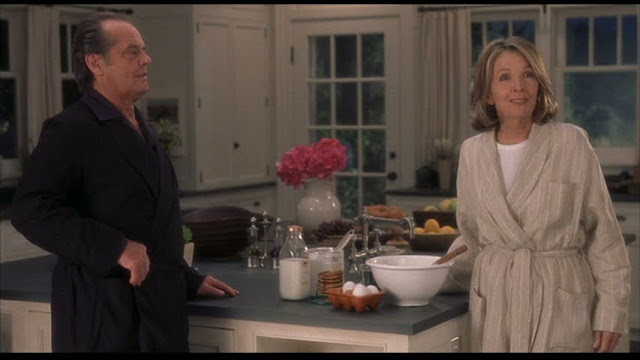 I've gathered up all the pictures that I could possibly find of The Kitchen so that we can ♥swoon♥our little hearts out together today. It's all so elegantly understated. 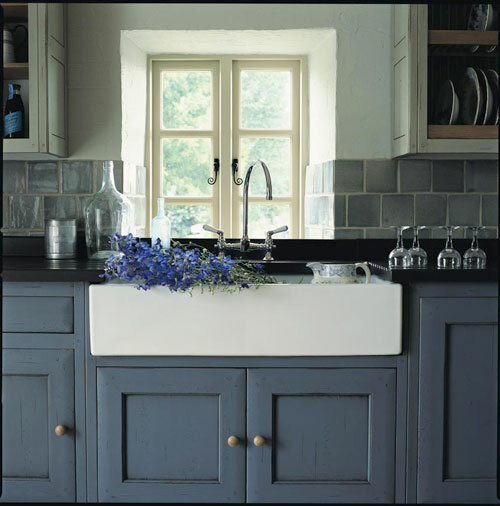 I love the matte soapstone worktops and the white Shaker units. The subway tiles and the hardware. 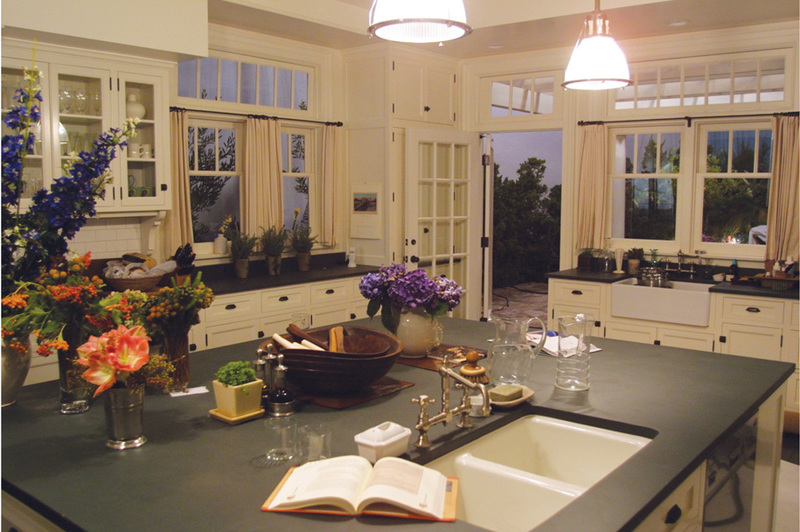 The inset sink and the pendant lights. The books in the island and the moulded top-cabinet supports. The taps and the windows. Now, about yesterday's garden post, I've been thinking of throwing an English Garden Party for people to link up their gardens or flower-related ideas. I'm just desperate for Spring to come and I thought it would be such a perfect way to herald it's coming. I'm just putting the finishing touches to the button. 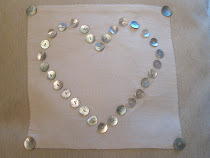 Speaking of finishing touches, I've just completed the most lovely Valentine's gift idea. I don't know about you but I'm getting to that time of year when I'm longing for Spring. Longing, yearning, craving. I thoughtyou might like to see a photo of our garden at its peak. Oh garden, I miss you. But seed catalogues provide their own special brand of cheeriness for me in mid-January. 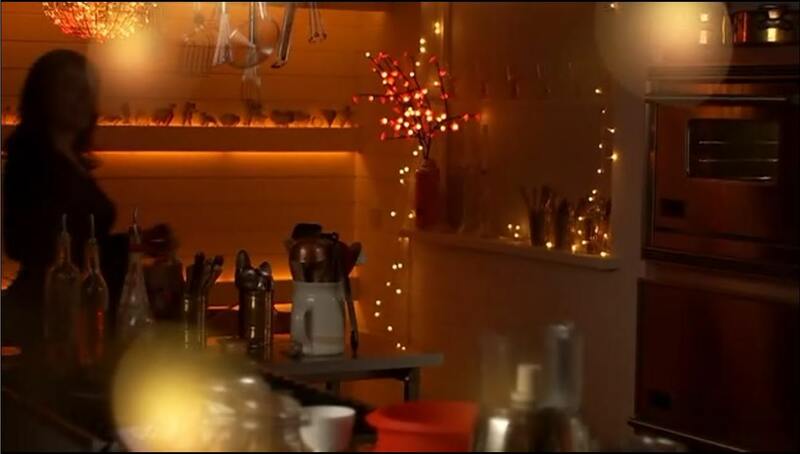 You want a cup of tea and a chat in my kitchen? Oooh, me too! Me too! I hoped you'd come by. And, look, a teapot in your honour! I love using a teapot for tea. It makes me feel oh-so grown-up. I had some girlie friends round this week, for a bit of craftivity...and lots and lots of nattering. 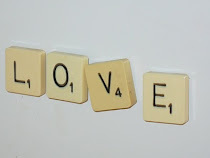 I got going on some Valentine's crafting which I can't wait to share with you. My Heart and Cinnamon Garland is in the new edition of The DIY Club's gorgeous ezine. There's a version below this post if you'd like a look. Oooh, I have a question for you....what do you think of this for a bit of eye-candy? It's from my colour inspiration file. I really like the pale grey-blue paired with all the white. 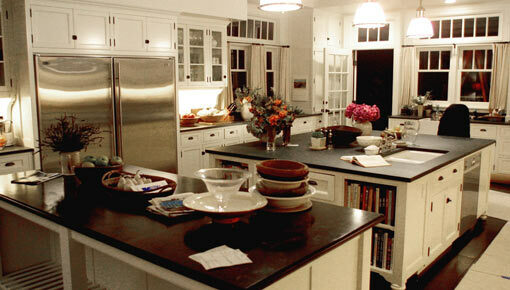 But I la-la-la-love it as a kitchen too. Can you guess which film it used as its inspiration? 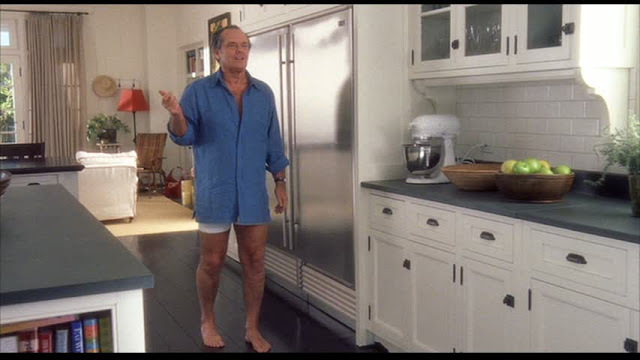 I'll be reviewing that very kitchen on Monday. I've got SO much loveliness to show you. I'm almost bursting with the excitement of it all. I'm linking up to my favourite parties in my sidebar. I hope you're feeling fine and dandy. But if you're not, if the cold wintry greyness is getting you down, then I have something to bring a happy smile to your sad little face. Only one of the most fantastic before-and-afters-on-the-cheap in the whole world ever. 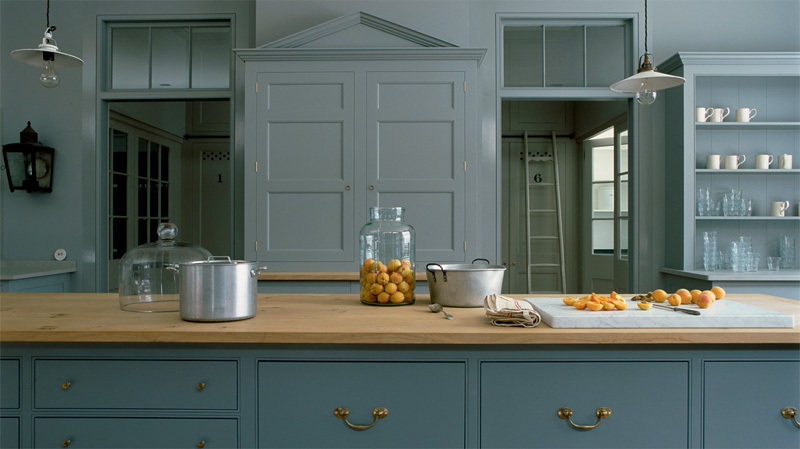 This is the kitchen of Anne Turner who was Assistant Decorating Editor for the magazine Cottage Living. It was featured in its last ever issue. 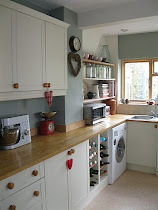 Anne has taken her kitchen that's best described as bleurgh......and made it scrumptious...but without a complete overhaul. Her budget at the time was needed elsewhere. 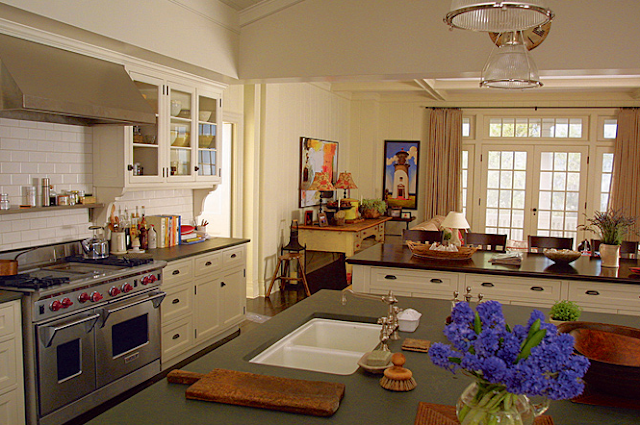 They've had the existing cupboards up towards the ceiling and added moulding around the top. Then, with the extra space created, shelves have been fitted under the units. Aren't they darling? 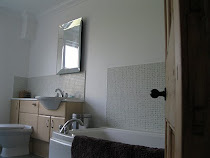 They've changed the tiles, the worktop, appliances, sink, hardware, doors, taps, flooring and lights. 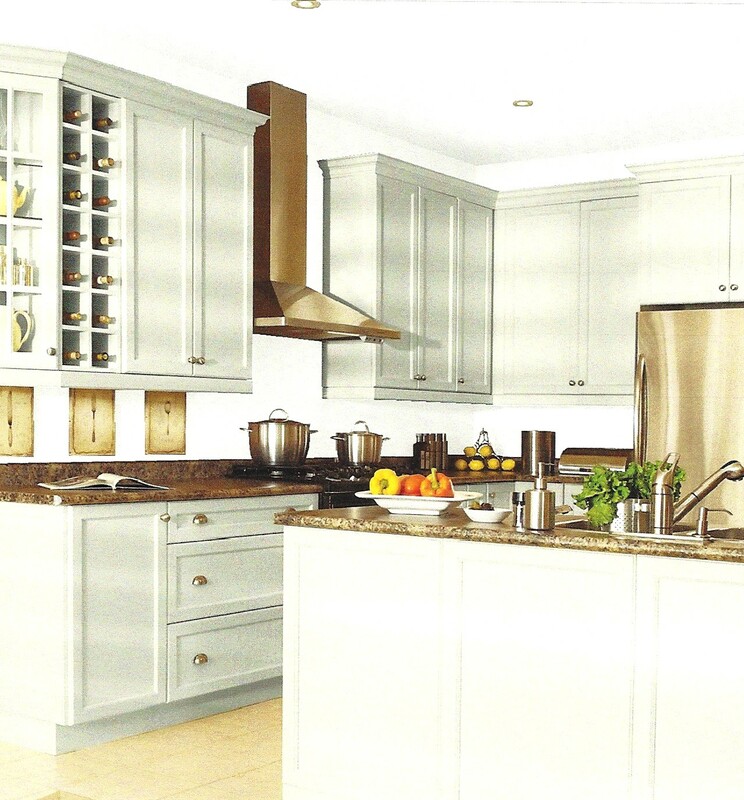 The result is like having a splediferous new kitchen without the huge cost of new units. And don't you love the paint colours? Mouse's Back on the units. All by Farrow And Yummy Ball. Well, are you smiling yet? This afternoon I will be having the pleasure of ironing my way through the laundry equivalent of Mount Everest. Bet you're smiling now....you ol' meanie. "Daddy, I don't mind you hiding in good places but please can you not go anywhere magical." Magical? I think he thinks his Daddy hides in Narnia. Mr Modern Country, your hiding places are just too dang good. Today, my thoughts are turning celebrity-wise. 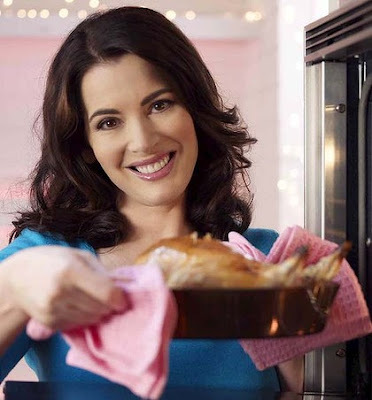 To Nigella Lawson, in particular. Can I be sued for lying on here? This is her fridge behind her. Isn't it lovely with those hinges? 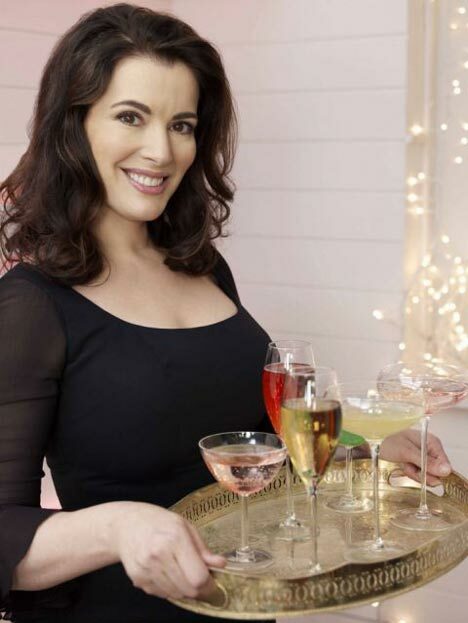 Something tells me Nigella is fairy-light-crazeeee. 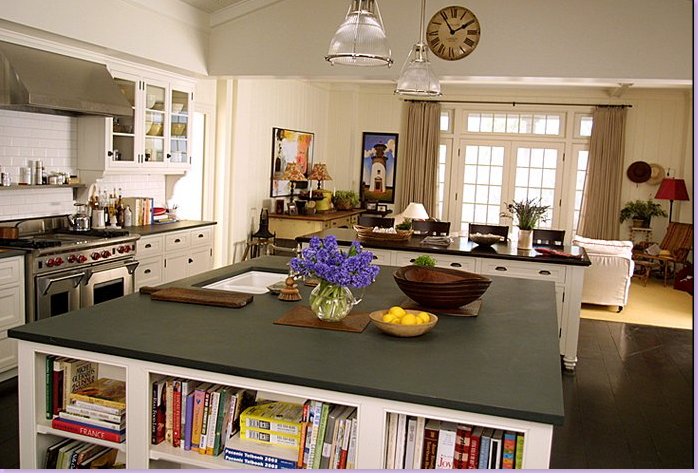 I like her idea of displaying her cookie-cutter collection on her kitchen shelves. 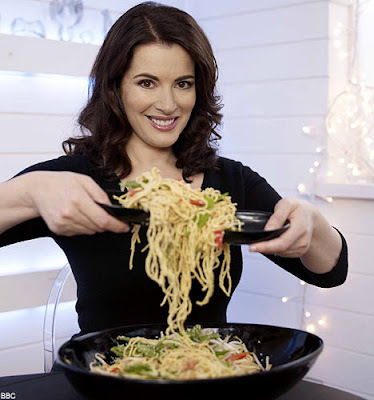 Now, Nigella, we do love you but you do just keep getting in the way of the camera. Please will you just keep your head out of the photo for one second so we can have a proper nose around your kitchen? 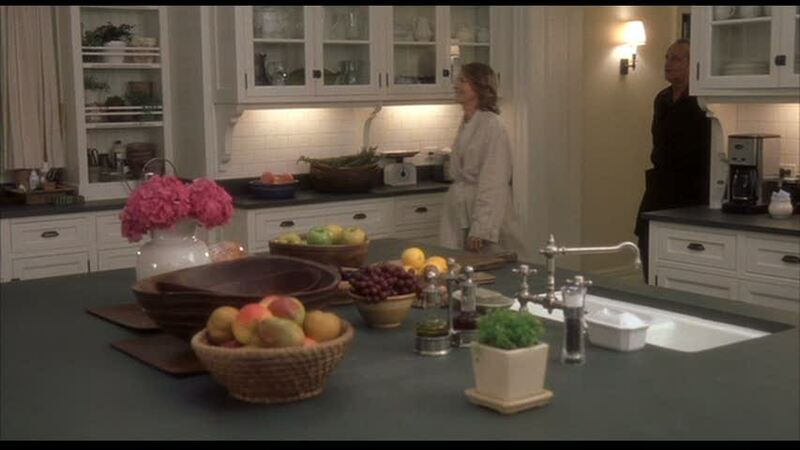 It's her kitchen, and she'll show off if she wants to. 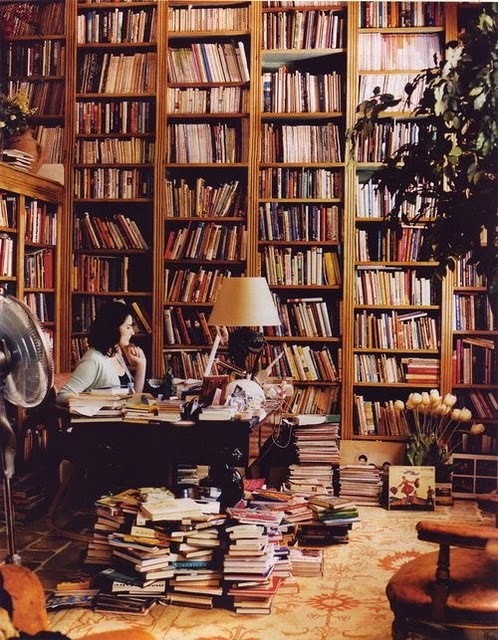 Oh wait, one last thing, Nigella We've noticed that you don't have many recipe books. How wonderful to see that you can be so frugal. That's a lorra lorra books. But....yummy.....this more than makes up for it. Why, thank you, Nigella. Don't mind if I do. 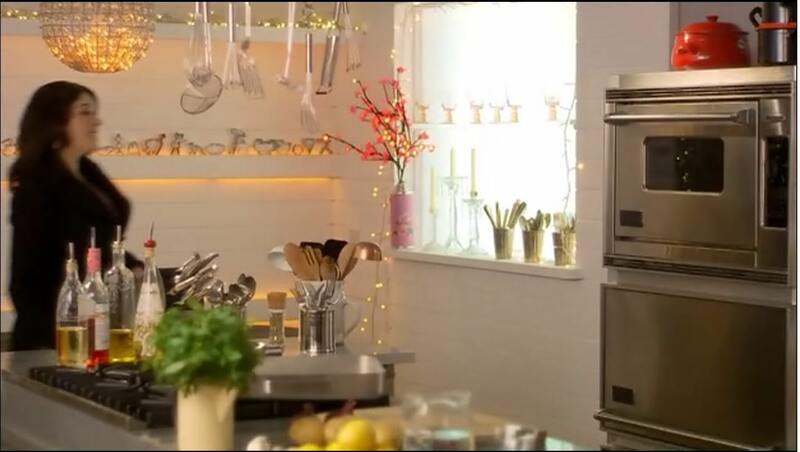 Can't wait to see you again soon for more kitchen delectability. Hello my lovely Friday. I'm so pleased to see you again. You are my absolute favourite day of the week. Oh, I'm so excited. Yesterday, I noticed our daffodils pushing up from their winter rest. And the snowdrops are in bud. Real proper buds. Ready to reveal their beautiful dropping heads. And it feels as though it's just for me. Come on, Spring....you can do it. We're rooting for you. Step 3: Choosing a Colour Scheme. I have to tell you that choosing colours is my absolute favourite part of the whole process of renovation. I am Mrs Colour Chart and Mrs Sample Pot all rolled into one gloopy delight. I scour lots and lots of pictures and save my 9 out of 10 choices. Ring any bells here? Yup, this is Step 1 again but altered to cater for colour instead of style. Some of my 9 out of 10 pictures aren't necessarily in my style pile (oooh, Style Pile.....that rhymes). But I'm not looking for that here. I've already narrowed my choices style-wise in Step 2. Once I've collated a colour inspiration pile (Collated....doesn't that sound a grown-up word to you? Yup, I can collate now, real adult that I am), I leave it for a week or two and then go through it again, making sure my choices are still 9 out of 10s. Then I take a careful look through. One colour almost always dominates my pile. And, with a bit of tweaking, that's the main colour I choose. 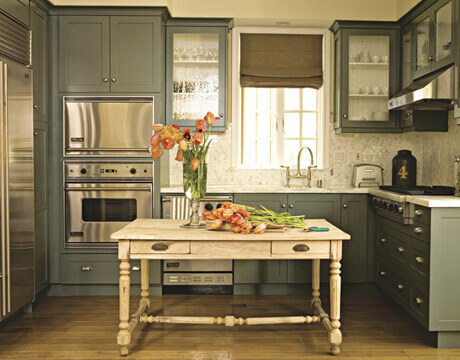 For me, the colour that stands out in my choices is a gorgeous grey-blue-green colour. Yum, my favourite colour in the world. Have you checked out Swoon Worthy? 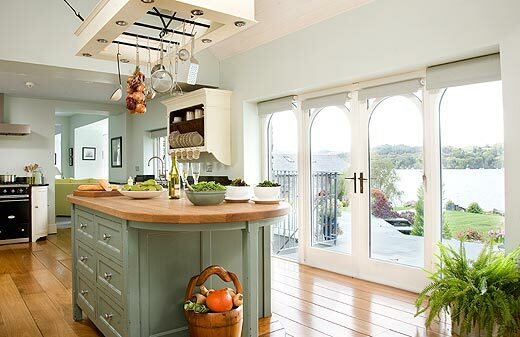 She's just beginning on sharing her kitchen inspiration........gorgeous, Missus. Check out the way she followed Step 1 here. Do you know, I can't stop thinking about the garden at the moment. I'm starting to feel it calling to me. I'm hoping to spend a bit of time out there this weekend, pottering and tidying. Best Soft Industrial Home in the World....Ever!